Pakistan is bolstering its position as a trading zone for small arms and military hardware through arms fairs that have become a regular feature in recent years. two years in the southern port city of Karachi, provides a platform for Pakistan to display its products, ranging from light arms to tanks and missiles. The fair also attracts major manufacturers of arms and military support equipment from around the world. Since 2000, when the first Ideas fair was held, the number of participants has grown both in number and prestige. This year's participants include, among others, Northrop Grumman, Raytheon, Lockheed Martin, Saab, Rolls Royce and Thales. Some governments also have an official presence. The UK is represented by the Ministry of Defence. "We are looking to promote industrial cooperation in products which are geared towards the war on terror and humanitarian operations," the press secretary at the UK High Commission, Adam Thomas, told the BBC. The theme of the five-day fair, which was inaugurated by President Pervez Musharraf on Monday, is Expanding Global Security. Arms for Peace is the official slogan of the fair. 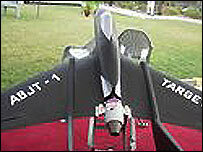 On show are products ranging from rifles and bullets to ballistic missiles, pilot less drone aircraft and fighter jets. Lockheed Martin Corp (LMC) has put its Hellfire missiles on display. "Pakistan is interested in buying these missiles and we are definitely going to work out a deal," said Doug Terrell, LMC's manager for international business development. The missiles became famous during the war on terror and are known to have hit many targets in Afghanistan and the Pakistani tribal areas. LMC is also promoting its coveted F-16 Fighting Falcon as well as the more affordable P-3C Orion and C-130 aircraft. "We have (displayed) a limited range in view of the customers who would be here," says Dexter Henson, the communications director of LMC. The buyers, as in any arms fair around the world, are mostly from Asian and African countries that have low budgets and, as many anti-weapons campaigners would allege, poor human rights records. Buyers were crowding to the American manufacturer Colt's small arms stall where the company's manager of international sales, Mike McCarthy, explained the virtues of a Colt M4 carbine, "the assault weapon of the US army". "We hope to offer it for sale to the Pakistan government," he said. Pakistan has showcased its usual products, such as long range missiles and two battle tanks, al-Khalid and al-Zarrar. But it has also displayed some new items, such as a locally manufactured pilot less drone aircraft. It has also displayed the prototype of JF-17 Thunder jet, manufactured jointly with China. There is also a variety of electronic warfare devices and small arms made in Pakistan which some visitors described as "impressive". How much of a boost they will prove to Pakistan's arms trade remains to be seen.